I was in choir practice in high school, fifteen and overeager in all things. We had just performed an original piece for its composer, and were electric with nerves and excitement as we sang his work back to him. My classmates laughed. I laughed loudest. I weighed more than 200 pounds. That moment isn’t the most pronounced of my life in a fat body. There is no external assailant, no villain to vilify. But it haunts me. Why did I so readily take the mantle of deriding myself? Why was I so thirsty to rebuke my own body? And why did it feel so cathartic, so good, to laugh at what had been posed as an impossibly fat person? Thinking back on it now, years later, I remain so ashamed of that moment. And I remember that laughter felt like my only choice. I laughed because I didn’t want anyone to notice me. I wanted to disappear into the backdrop, be absorbed into the joke so I wouldn’t be spotlit as its subject. In moments like these, I could feel every inch of my skin, every hot pore, every hair on end. I could feel my body reawaken, exhausted and alert to this same old threat. The only defense I had, the only defense I could muster, was to laugh. I laughed as protection. And I laughed as a reflex, because that’s what you do when someone mentions being fat. You laugh heartily or you recoil. You came to me, dear friend, profusely apologizing for offhand remarks, callous thoughts, biases you might have acted on. You were mortified by your actions, and by the thoughts that came so readily that you never even questioned them. You were shocked by the naturalness of your own bias toward bodies like mine. I want you to know that I have been shocked by my bias, too. I don’t remember the hurtful things I’ve said about fatness or other fat people. They came too readily, flowed too easily, and were too consistently affirmed. I do not remember the shape and taste of each breath, the heft of it in my mouth, or its hot exhale. I do not take stock of the things I am built to do. All of us are borne of a culture that rejects fat people at every turn. How could we know to do anything different? That culture rears its head in moments like street harassment or public humiliation. At its strongest, that beast finds its prey in the most vulnerable bodies among us. But it is fed and nurtured carefully by all of us in the little moments — fat jokes, diet talk, the steady hum of body hate. The “I hate my thighs” and “I have to cover my arms” that are witnessed by our friends, children, families, strangers. The remarks that take down their bodies with our own. The “I can’t pull off that outfit” that’s a message in a bottle, drifting onto the shore of whoever hears it. Bodies that look like mine don’t deserve to be seen. It makes hating our bodies feel like the most natural thing in the world. Themost relatable way to talk about our bodies becomes talking about their lack, their insufficiency, their shortcomings, the litany of disappointments and heartaches they cause us, and the failures in our character that create their imperfections. When we talk about our bodies, most of us talk about our failures to tame them. Like horses, our bodies are only useful when broken. But fat bodies cannot simply be broken. Fat bodies must be eliminated. A healthy world, a happy and functional world, is almost always envisioned as one without bodies like mine. The message about my body is clear: we’d all be better off if you weren’t here. That belief is atmospheric. It is the air we breathe, the language we speak, the way we relate. That belief is what makes it so difficult to trust friends when they say you look great, but I hate my hips. That belief is what makes it so hard to accept your sweetest compliments. When you pay me compliments, my darling friend, they are often drowned out. Your kindest words are swallowed whole in a cyclone of individual acts and deeply held beliefs that reject my body as myself. Those beliefs say that bodies like mine can’t be happy, can’t be healthy, and ultimately, should not exist. The greatest challenge facing me isn’t the names shouted by strangers, the indignities on airplanes, the dismissals in doctor’s offices. It’s the hard truth that even those closest to me believe that the world would be better off if I weren’t here. That belief sinks in for fat people. It is visited upon us every day in casual conversation, TV shows, magazines, stares from strangers. It can isolate us from loved ones, cut us off from culture, tell us we’re not wanted. Its subtle violence permeates gyms, restaurants, family gatherings, schools, workplaces, our very homes — everywhere. Over time, understandably, we may internalize that belief. We are told with such regularity that we are unwanted, unlovable, undeserving, that we can come to believe it. When we do, we become the self-fulfilling prophecy of the sad fatty, the very image of isolation and loneliness that created us, rejected by the precise response we were always intended to have. Resisting that belief isn’t much easier. When we take the simple step of naming fat hate and its effects on our lives, we’re met with accusations of “glorifying obesity,” or “promoting an unhealthy lifestyle.” The simplest act of self-preservation becomes a reckless assault. Acceptance of a fat body is negligent. Love for a fat body is inconceivable. Pride in a fat body is an attack. It takes extraordinary strength to keep up such a taxing fight for your dignity, your right to eat a meal, show your body in public, exist in the body you have.And in the thick fog of that belief, many of us give up our passions, our plans and our dreams. Our lives contract, ever shrinking away from the spaces that reject us. We begin to believe that we deserve less, are capable of less, are destined for loneliness and rejection. And this, my darling friend, is the cruelest trick and greatest triumph of that toxic culture. It stops us before we start. It breaks all of us, whatever our size or shape, and keeps us from pursuing dreams, relationships, careers and passions that seem only to be reserved for a few certain bodies. It burrows into us, a virus we carry, a contagion we spread. Our rejection of our own bodies is its greatest creation. When I tell you about comments from strangers and colleagues, family and dates, you ask me what you can do, how you can help. The simplest answer is that you can intervene. 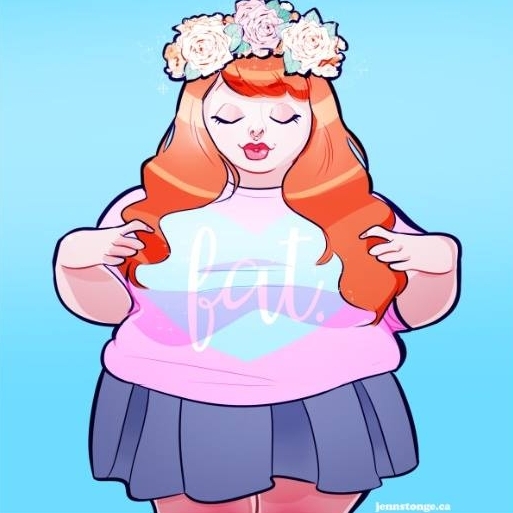 Say something, anything, to stop the dismissal and rejection of fat people, whether or not you love them yet. Rise to the occasion of who you aspire to be in those brief and exceptional moments. But the truer answer, the realest change, is much more difficult than that. Because you, dear friend, have never been the problem. The problem is that poisoned well of beliefs and talk about our bodies. The problem is that each of us keeps going back for more. We passively accept, and sometimes even fervently defend, its slow choke on our lives, relationships, desires, passions. Too often, fat people are told that our self-esteem is too low, our body image poor, that we don’t love ourselves enough. But all of us could stand to love ourselves a little more. Your stinging rebukes of your own body stand in sharp contrast to your calls to love mine more. Your disdain for your own body is as concrete a barrier to supporting me as any stranger’s shouted insult. Becauseyou are attacking someone just as ruthlessly for their size and shape — that person just happens to be you. The greatest gift you can give me, dear friend, is to let yourself go. Let yourself believe that your body is sufficient, just as it is today. Stop beating it into submission, publicly listing its shortcomings and your own failings. Treat your body as tenderly as you would mine. Take care of it. Praise it. Feed it. Feel the joy of moving it, and the power of its strength. Savor its resilience, and the gifts it brings you every day. Allow it to be loved, even if you can’t yet provide that love yourself. Learn to let go of the false meritocracy of bodies, the heartless ranking, and the belief that you will earn a loving partner, a fulfilling job, a good vacation, or a happy life if you can just drop that next fifteen pounds. There is a ruthlessness to that logic, a cruelty to that standard that you would never apply to anyone you love. You know that they deserve happiness, safety, security, dignity and love, just as they are today. And so do you. Accepting your body will serve both of us. Because when you embrace your body as it is, you send the message that it is possible, right and regular for those around you to do the same. Doing the hard work of accepting yourself will disrupt the tired, ubiquitous scripts — “you look great, I look terrible!” “I wish I had your arms. Look at all this flab!” When you opt out of those conversations, you model an unexpected, disruptive act; an aspirational way of being that most of us don’t consider. You become a glimmer of a world that’s possible. And when you accept your body as it is, you become able to see both of us, as we are, in the bright light of that new world. You can explore the reality of your body, and the truth of mine. You can make room for each of us to discuss, openly and honestly, the differences in our bodies, and the realities they create in our lives. We can build our muscle and stretch to understand each other more honestly and intimately. We have a gargantuan task ahead of us, you and I. We’re making a new world for ourselves, and starting with our own bodies. I need you to build that muscle so we can get into the bones of the matter, and transplant their marrow. I need you to learn to love your body so we can get to the heart of the heart of the thing. So let yourself go. Let yourself go so that you can hold so much more. Let yourself go so that you can embrace us both. Stop holding yourself back so that you might use that strength instead to build a world that welcomes us all, whatever our bodies. Use them to uproot invasive crops and replant something that feeds the both of us. Take on the hard and necessary work of undoing all that negligence. It is unquestionably easier to accept the beliefs that are handed to us. And, as is so often the case, the more meaningful thing is the more difficult work. It is a laborious task to learn to embrace ourselves as we are, especially in a culture that keeps us striving for an impossible ideal. And rejecting our bodies comes as naturally as breathing. Yes, we will need to change the way we breathe. Notice your breath now. Feel it scrape in your throat and cool your lungs. Take another breath. Let it fill your belly, then chest, then throat. Saturate your body with air. Think of the focus that requires, taking stock of every breath, and breathing like you mean it. That’s the focus I need from you, dear friend. That’s the energy it will take to uproot that toxic belief in yourself, and take on the hard work of making room for all of us — including you. We all need your compassion and empathy. Start with yourself. Know that my acceptance depends on yours. Then let’s take on the world. Like this piece? There are more like it, including “’Sweetie, No!’: The heartbreak of ‘you’re not fat’”and A call to action: your fat friend is going it alone.